← The First Ride of 2011! One of the cool things about using a GPS enabled heart rate monitor, such as the Garmin 305, is that you can easily map your workouts. Not only does this provide you with pace, distance, and elevation data, but it also gives you an entirely new source of motivation and inspiration. 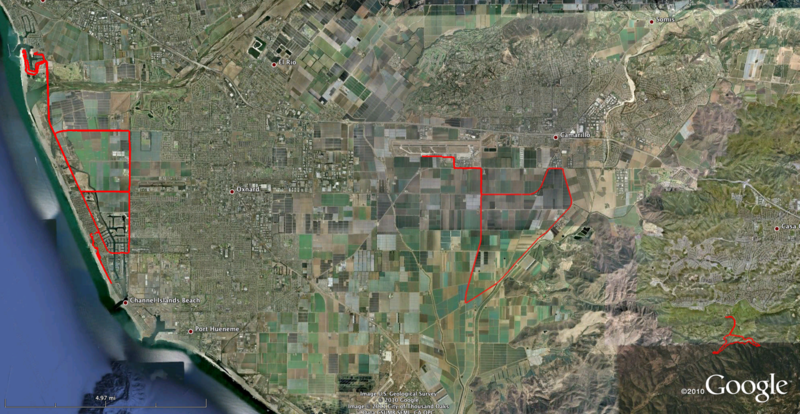 You can see in the above map how concentrated my workouts are in certain areas of greater Santa Barbara/Goleta. The waterfront of SB, to Goleta, the airport, and UCSB. Included in this map are the UCSB Triathlon, Santa Barbara Triathlon, Chardonnay 10-miler and my Jesusita Trail runs. Looks I got around on foot and the bike, but one thing bugs me… how isolated the groups are. Perhaps, in 2011, I will have to bridge the gaps. 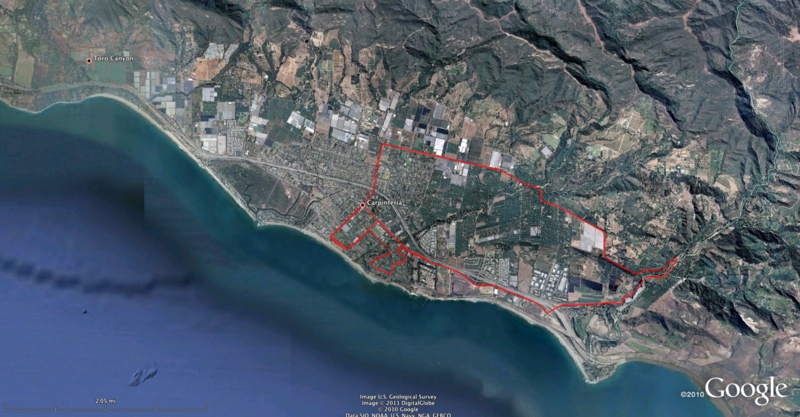 I had some issues where Google Earth would not draw Carpinteria routes with Santa Barbara. So, the above map is the area just off the right of the Santa Barbara/Goleta map. Workouts in this area include the turn-around for long bike rides via the 150 and the Carpinteria Triathlon course. Most of these workouts originated at East Beach in SB, but some started at the Carpinteria State Park. This area is where 2010 began, with the Boney Mountain Trail Run, which is mapped in the lower right of the map. We also have the Ventura Triathlon, Strawberry Fields Triathlon and the Camarillo Duathlon (not as an official participant) mapped out as well. Pretty exciting. Looking at these maps has already provided some inspiration for 2011. As I noted before, I would love to start connecting the gaps between Goleta, Santa Barbara and Ventura. This is going to mean climbing some gnarly hills, many, many more miles on foot and on the bike. But then endurance athletes are known for their insane abilities. I seriously can’t wait until next year, when I can review the 2011 maps and see where I have been. Who knows, maybe I’ll get some training in outside of California! This entry was posted in analysis, Cycling, Fitness, inspiration, milestones, Running, Tools, Trail Running, Training Charts, Triathlon Charts, triathlon training, Workout Logs and tagged Triathlon, Triathlon Charts, visualization, workout. Bookmark the permalink.